August | 2007 | Chickens Don't Clap! Remember, the fantastic Strawberry Jam comes out on Sept. 11th. Pre-order it from Insound if you haven’t already. Following the long overdue realization of SMiLE after 35 years, the album that many hold to be his masterpiece, Brian Wilson plans on unveiling his latest material on September 10th at London’s Royal Festival Hall. What’s even better is that he posted a song from the upcoming That Lucky Old Sun (A Narrative) on his website about a week and a half ago, which I hadn’t heard about until this morning (via Stereogum)… and I’m actually enjoying it quite a bit. 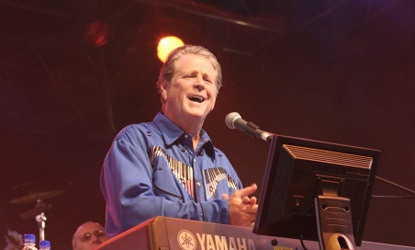 Though Brian Wilson’s solo career has been hampered by the many complications of his personal life and has met mostly mixed critical response (outside of SMiLE, obviously), perhaps the completion of his great, lost project has revitalized his songwriting. “Midnight’s Another Day” doesn’t quite approach the insane genius of SMiLE or Pet Sounds, but it’s definitely solid, somber Brian Wilson. And even though I automatically question the use of spoken word in this new project, this song makes the Wilson-fanatic in me a little more excited. Stream it over at Brian Wilson’s website. After discovering his empty cassette case for Black Flag’s seminal Damaged at the house he grew up in, Dave Longstreth (of Dirty Projectors) did not go out and buy a new copy in order to revisit one of his first favorite records — he went to Guitar Center, bought a four-track and decided to rewrite the album himself, completely from memory. 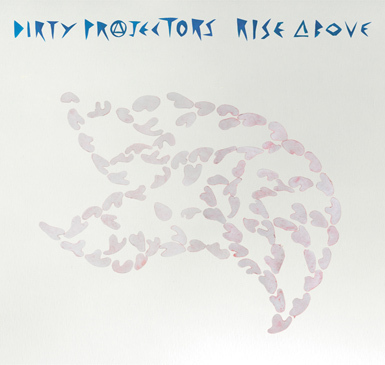 From those demos spawned by this peculiar and ambitious idea comes Rise Above, the Dirty Projectors’ fully developed conception of a preexisting record that falls somewhere between cover album, homage, and original creation. 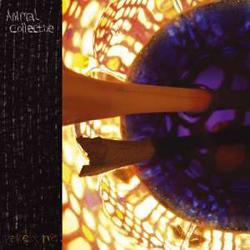 Apart from the excellent concept underpinning this album, it’s also executed exceptionally well. A very different and more challenging listen than the original, the Dirty Projectors version is dominated by dissonant pop overtones, soaring three-part vocal harmonies, Longstreth’s tortured, off-kilter lead vocals, and intricate guitar riffs that push parts of the record into near math rock territory. On top of the compositional achievements, Chris Taylor (of Grizzly Bear) lends his production skills for Rise Above and instills these sparse recordings with a stunningly full sound. I am particularly enjoying a number of works this year that manage to unite the beautiful, the grating, and the strange into truly compelling albums. Rise Above is definitely one of those records, and it’s also one of the most interesting (and rewarding) projects of the year. I highly recommend picking it up when it comes out on September 11th. Until then, check out the incredible reinventions of “No More” and “Depression”, two of my favorite tracks on the album. 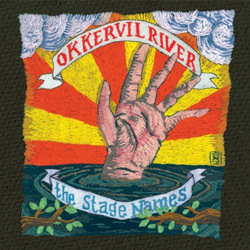 I’ve never really gotten around to listening to Okkervil River all that much, but The Stage Names is making me feel like I’ve made a huge mistake. Will Sheff has enjoyed a fair amount of critical success over the past few years and again he’s crafted an album that is already being called one of the best of the year. His emotional, folk-tinged power pop recalls the force of Springsteen at times (“Our Life is Not a Movie or Maybe”), yet the album also manages to balance that with a fragile sweetness that’s sure to draw you in again and again. The smooth and poignant integration of the Beach Boys’ “Sloop John B” into the closing “John Allyn Smith Sails” is not to be missed either. Buy: Order The Stage Names from Insound. I don’t know if M.I.A.‘s been engaging in consciousness-expanding activities or what, but this new record feels a lot more spacey and psychedelic than her 2005 debut. I’m not sure if I can say that I like it more than Arular, but it does have a number of bangers on it, not to mention some seriously impressive production pretty much throughout the whole album. At the very least, M.I.A. has definitively shown she’s got the talent to expand on her already diverse sound. Peep the tribal drum-heavy, squawking insanity of “Bird Flu” (yep, she’s still reppin’ the Third World) and that awesome Clash sample on “Paper Planes”. Buy: Pre-order Kala from Insound. It’s fitting that The New Pornographers would release an album in what has become an extraordinary year for indie pop. If we can accept their oft-given title of indie rock supergroup, then Challengers is further evidence that they’re one of just a handful of active supergroups worth listening to (Velvet Revolver, anyone? *gag*). But really, both of these tracks are absolute gems — one from each of the primary songwriters. It seems almost unfair to other pop acts that A.C. Newman and Dan Bejar are writing for the same band… it’s gotta be tough to top that. Buy: Pre-order Challengers from Insound… (or the Deluxe Edition). Indie pop darlings Rilo Kiley are also back this year with Under the Blacklight. The first released track, “The Moneymaker”, has inspired some mixed responses from internet taste-makers, but I think most will agree that the soulful pop of “Silver Lining” is much more enjoyable, if a bit a familiar. I’m such a sucker for hand-claps though. Buy: Pre-order Under the Blacklight from Insound. And let’s not forget the “Peacebone” single. It’s hard for me to call this “one of the best songs” off Strawberry Jam only because all of the songs are just so damn good. A ferocious opening track, “Peacebone” is a straight up onslaught of the twisted, sugary experimental pop that characterizes the fantastic new Animal Collective album. I’m posting the song, but honestly… if you’re still on the fence about this record, I don’t even know what to say to you. Included on the single is the sprawling B-side “Safer” and remixes by Black Dice and Pantha du Prince. Buy: Pre-order the “Peacebone” single from Amazon… and pre-order Strawberry Jam from Insound. “Plaster Casts of Everything”, the opener of the upcoming self-titled Liars album, is probably the most straightforward rock song they’ve written since their 2001 debut. And yet, that is somehow the most unexpected thing they could have done. But fear not, dear readers, although they’ve adopted more traditional song structures and trimmings for this record, they’ve still maintained their experimental tendencies. The dense, droning krautrock of Drum’s Not Dead is still a heavy force on the Liars fourth effort, and even gets blended with a little 90’s trip-hop (!?). In other words: yeah, it’s still one of the weirder albums you’ll hear this year. 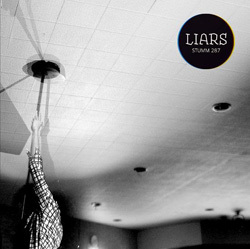 Buy: Pre-order Liars from Insound. On top of all the albums that come out this month, the FREE Panda Bear Live DVD is now available over at Eat Tapes. Beyond the stellar basic package, you can also order a version with a bonus disc of uncut performance footage for a cheap donation ($5-10). This is clearly the better (and moral) choice of the two. Don’t miss out on this, head over here and order a copy.